Every day, soldiers leave their families to protect others. 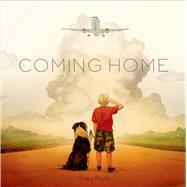 Greg Ruth is the illustrator of many graphic novels and books for children, including A Pirate’s Guide to First Grade and A Pirate’s Guide to Recess by James Preller, and is also the author/illustrator of The Lost Boy, a New York Times bestseller. He lives Ashfield, Massachusetts, with his family. You can visit him online at gregthings.com.